Useful website to teach history, literature, world history and culture, language, art, and more! Here are a handful of useful resources for both the teacher and the students. Some are websites, some are extensions for your Chrome Browser. Might come in handy with only one month left before the exam. This site offers lesson plans and interactive media. EDSITEment offers a treasure trove for teachers, students, and parents searching for high-quality material on the Internet in the subject areas of literature and language arts, foreign languages, art and culture, and history and social studies. All websites linked to EDSITEment have been reviewed for content, design, and educational impact in the classroom. They cover a wide range of humanities subjects, from American history to literature, world history and culture, language, art, and archaeology, and have been judged by humanities specialists to be of high intellectual quality. EDSITEment is not intended to represent a complete curriculum in the humanities, nor does it prescribe any specific course of study. Crash course offers videos on many subjects. Great way to either start a topic or revise for exams and tests. From the website: Tons of awesome courses in one awesome channel! Nicole Sweeney teaches you sociology, Carrie Anne Philbin teaches you computer science, Craig Benzine teaches film history, and Mike Rugnetta is teaching mythology! Check out the playlists for past courses in physics, philosophy, games, economics, U.S. government and politics, astronomy, anatomy & physiology, world history, biology, literature, ecology, chemistry, psychology, and U.S. history. My favorite is U.S government. Those valuable records are preserved and are available to you, whether you want to see if they contain clues about your family’s history, need to prove a veteran’s military service, or are researching a historical topic that interests you. They have a video site where you can find a lot of interesting footage. They also have something called DocTeach were you have access thousands of primary sources — letters, photographs, speeches, posters, maps, videos, and other document types — spanning the course of American history. We’re always adding more! Here is their YouTube channel. Knoema is a search engine for data seamlessly connecting public and private sources and making data discoverable and accessible to information workers. Knoema does for data what Google did for websites and the Internet overall. It makes it trivial to find data when you need it and make a story out of it. The name derives from the combination of knowledge and the Greek word νόημα (noema), which stands for “what makes sense”. It offers many useful statistics students could use when writing exam papers. 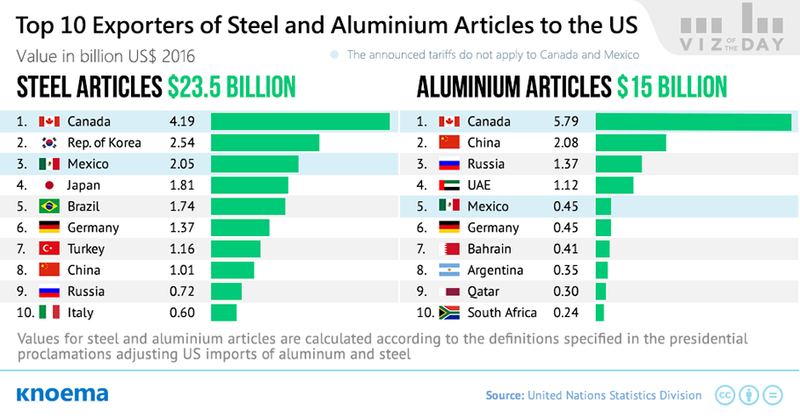 Like the 10 top Exporters of Stell and Aluminium that I have included below. You can compare crime in different countries, the list is endless. Previous Post: FACTFULNESS, THE STRESS-REDUCING HABIT OF ONLY CARRYING OPINIONS FOR WHICH YOU HAVE STRONG SUPPORTING FACTS.